If Munich is the capital of the beer-drinking faith, this is where pilgrims come to pray. 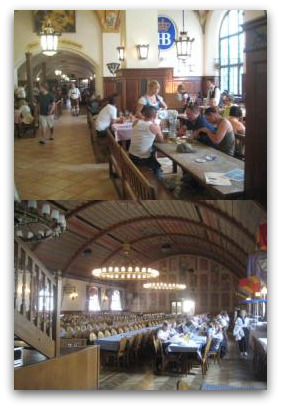 The mighty Hofbräuhaus (or as it's usually spelt in English, Hofbrauhaus) is like a mini-Oktoberfest all year round. It’s not Munich’s best beer-hall but it has simply got to be done. I always take friends or relatives here when they pay me a visit. I even took my mum here for a beer or two. It started raining hard so we stayed and got well tipsy together. BEER ME! : A few friends of mine on a visit to the Hofbräu. There’s a famous anthem about the Hofbräuhaus which has become an integral part of many great Bavarian beer-swills, it goes “oans, zwoa, gsuffa” meaning “one, two, chug” – you get the idea. This could be Munich's most recognised address. 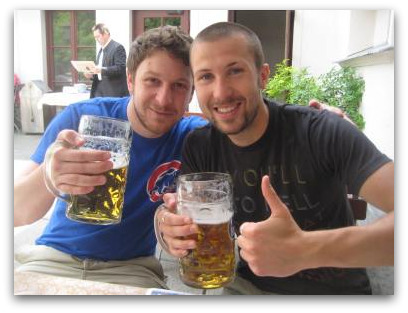 Most Munich locals claim to hate the Hofbräu but I think they’re secretly as proud as punch. Could there be a more famous pub than this? The ground-floor tap room is called the Schwemme, with space for more than 1,000 drinkers. Here you can watch barmaids bear 10 litres of amber fluid and listen to old guys in lederhosen play oompah music. There’s also a lovely beer garden with traditional chestnut trees and a big old fountain, a perfect setting for a few summer beers. Bräustüberl, which has a nice view over the square outside, called Platzl. hall and below, the mighty Festsaal. 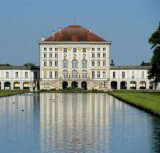 On the second floor you'll find the cavernous Festsaal, lined with the flags and standards of the various dominions once belonging to Bavaria. That’s where, incidentally, Hitler founded the Nazi Party in 1920. 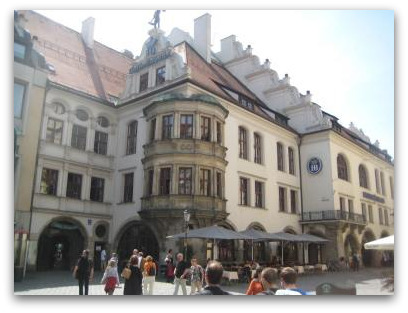 Now it's also home to the HB-Ausstellung (Hofbräuhaus Exhibition) where you can learn about the establishment's 400-year history, going back to the days of Duke Wilhelm V.
The duke founded the Hofbräuhaus in 1589 because he wasn’t happy with the beer from Munich’s other breweries. The royals kept the liquid gold to themselves until 1828 when they finally pulled out the cork for the public. 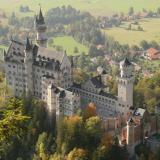 • Return to the main Munich Attractions page. • Jump from Hofbrauhaus back to Destination Munich Home.